First Line: I've heard it said, by those that cannot possibly know, that in the final moments of a man's existence he sees his whole life pass before his eyes. Young William Bellman was a popular and gifted boy. If anyone could make an impossible shot and kill a rook with his slingshot, it was William. His father having abandoned them, William was raised by his mother, and they shared a close and loving bond. He applied himself and soon had an important position in the local mill as well as a happy marriage and four beautiful children. Everything he touched seemed to turn to gold. It would appear he could do no wrong. But when death came to his village, he was powerless to stop it from ripping his life apart. After making a deal with a very strange man called Mr. Black, William Bellman turned his back on his mill and turned to a very macabre branch of the retail trade. However, regardless what he did, William Bellman would always have an unreasoning fear of rooks... and of death. 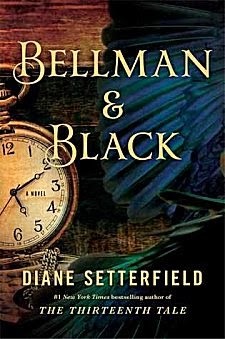 I-- like so many others-- loved Diane Setterfield's first book, The Thirteenth Tale; however, do not make the mistake of reading Bellman & Black expecting it to be more of the same. It most decidedly is not. If you're the type of reader who wants "something to happen" on a regular basis throughout the story, this may not be the book for you. Also, in some places online I've seen this book subtitled "A Ghost Story." The ghosts in this book are not ones we've come to expect from stories with this label. At the rate that I'm throwing up caution signs, you're going to think that I didn't enjoy the book. You would be wrong. It all boils down to a matter of reader expectations. The fewer you have, the more likely you are to enjoy this book. What were mine? I expected to read a very special story, and I did. Bellman & Black is firmly rooted in Victorian England. As William's responsibilities grow at the textile mill, Setterfield makes us right at home in that world. Through William's knack for business, engineering, and innovation, we see the burgeoning power of an industrial nation. When he completely switches gears and turns his talents to the retail trade, we see how a nation concerns itself with death and all its trappings. The author's research gives us a very firm foundation upon which to view her main character's world. And into this world of success is woven fairy tale-like elements of unease. Of something not being right. Of someone, or some thing, always looking over William Bellman's shoulder. Rooks-- those English cousins of American crows-- figure into the story from the very first page. Their appearance, their behavior, how they've played a role in the stories man has told throughout the millennia. They come to represent thoughts that William does not want to think, to represent memories that William wants to forget. The ghosts in this story are not moaning specters carrying clanking chains, although Bellman is caught in his own hellish version of A Christmas Carol. They are the ghosts of regret and pain and fear... all the nasty things that happen to us that we want to shove in a closet and keep there. I rapidly became immersed in this quiet story. The world Setterfield creates is a very Dickensian one, and I felt at home in the language and the visual feast she put before me. William Bellman is a complicated man, but throughout his somewhat misguided life, I cared what happened to him. Throughout the book, time flows in its own pattern. A year can take chapters, or in the space of two pages, several years can pass. Floating along in the gentle current of the narrative, I was never thrown to shore. Bellman & Black has a much narrower field of vision than Setterfield's first book, but in its own way, it is every bit as powerful. Cathy - Oh, this one combines elements that I like very much. A solid, quite plot and a historical context. And it sounds as though it's very well-written too. Thanks for sharing. Thanks--I was wondering if the person I got it for--who loved her first book--would be as pleased with this one, and it sounds like she will if I let her read your review first! I already had the final version of my review written when I decided to go take a look at what other reviewers had said. I was glad I said what I did because it was obvious that so many readers had opened the book with some very demanding expectations.